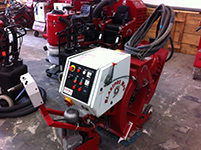 Nelson Industrial Services, Inc. BUYS and SELLS both used and fully refurbished shotblasting equipment. Production Capacity -> 1,500 sq. ft. /hr. Travel Speed -> 0-200 ft. /min. 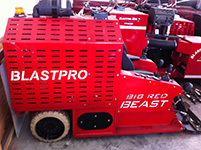 Blast Motor -> 27 HP Kohler. Optional -> Blast reduction plates for line stripe removal jobs. Production Capacity -> 1,500 sq. ft./hr. Travel Speed -> 0-200 ft./min. Blast Motor -> 27 h.p. 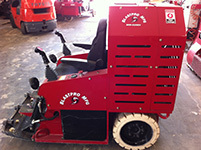 This 10” ride-on shot blasting unit has a fresh paint job, and an upgraded 27 hp motor with less than 4 hours. All of the liners, belts and blast wheel blades have been professionally inspected to insure they are in proper working order. Production Capacity -> up to 8,000 sq. ft. /hr. Travel Speed -> 300 ft. / min. Travel Speed -> Variable up to 250 ft. / min. Travel Speed -> 2.5-95 ft. / min. 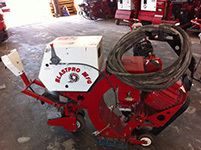 This Blastpro steel shot blasting machine has less than 60 hours of use. Some minor paint chips are evident from being disassembled and reassembled while being used in petro-chem tanks. 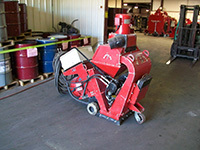 This unit has been maintained and serviced by factory personnel. Production Capacity -> 1,950 sq. ft. /hr. Travel Speed -> 0-100 ft. /min. Blast Motor -> 20 h.p. Power Cord Length -> 55 ft.
Production Capacity -> 1,550 sq. ft. /hr. Blast Motor -> 15 h.p. Production Capacity -> 450 sq. ft. /hr. Travel Speed -> 2 to 80 ft. per min. Blast Motor -> 4 h.p. Power Cord Length -> 50 ft.
Production Capacity -> 275 sq. ft. /hr. Blast Motor -> 3.35 h.p. 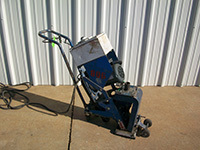 The BP-9-110v is a perfect machine for small jobs or as a complimentary machine on larger jobs. This machine small paint chips and normal wear on the handle. This machined has been professionally maintained and inspected by factory personnel. Power Cord Length -> 25 ft. This machine has been professionally maintained. 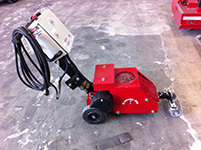 It has slight paint chips and light rust, but is in amazing condition for a machine with over 1,000 hours of use. Both the dust collector and blast unit have been inspected to insure they are functioning properly. Production Capacity -> 350 sq. ft./hr. Blast Motor -> 3 h.p. Weight -> 181 lb. Don’t let the cosmetic blemishes on this 1-8DEC fool you. It is a hardworking machine with a lot of production left in it. 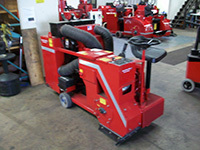 The liners and wheel kit have been professionally inspected, and this machine is in good working order. 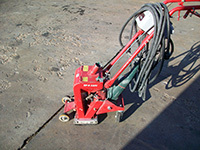 Nelson Industrial Services, Inc. services and repairs all brands and types of shotblasting equipment, ranging from minor repairs to complete renovations. With experienced and well-trained technicians on staff, no job is too big or too small. NIS only employees highly experienced mechanics, machinists, electricians, welders, fabricators, and hydraulic specialists to build and service their equipment. This vast network of skilled individuals collectively combine their knowledge and efforts to provide our customers with the latest innovations, ensuring maximum efficiency and high productivity.